"What's the best digital camera?" This is the most common question we're asked in our photography courses - here are our answers. After the uncertainty of September/October, it's safe to get a camera again now we know that today's lenses will work on tomorrow's mirrorless cameras. Prices are lower than this time last year, with genuine deals if you shop around - we've seen last year's runner-up camera of the year (Nikon D5600) for almost HALF of last year's price! Be aware that there’s a revolution about to hit cameras called “computational photography”, and if you're considering a camera with swappable lenses (a "DSLR" or "mirrorless" camera) it might change the camera you choose to buy. It will boost the quality of future cameras so much that there will be less of a reason to get bigger cameras with bigger lenses. I'm slowly changing to smaller "half-frame" cameras from huge "full frame" cameras. Taking all this into account, here are our recommendations today. They're based on how well we see cameras performing on our photography courses. Think of them as safe bets - great cameras with room to grow. Canon Ixus 185, $110 (down $40 from Aug). A versatile little camera, with a modest 8x zoom range. It's not really fast enough for action shooting - that's where bigger cameras shine. But it's good at landscapes and travel photos. There are more flexible cameras out there for a bit more money, but it's a good all-rounder and a much better alternative to a "toy" camera for a child who'll look after it. A endangered species of camera, almost killed by phones. Models with big zooms are the only survivors today. Great for travel without the pantomime of changing lenses on a bigger camera. Panasonic TZ80, $380 (down $60 from Aug) online or TZ90 (almost the same but with a tilting screen) $430 (down $70 from Aug). Both pack a huge zoom, good viewfinder and great night shooting into a small, easy-to-use package with a touch screen and wifi. Great 4k video, and an amazing mode that lets you focus after shooting (it really works! ), and extremely fast shooting. A huge step forward from phone shooting without lugging a big camera. Battery life is its Achille's heel, so get a spare before you go on holiday. The main reason to consider a bigger compact camera is for its extra zoom range. And these cameras offer truly staggering zooms. Nikon P900, $590 (down $200 from last year). This camera has one big gimmick: an enormous zoom. And it’s so much fun. You can fill a picture with the moon. I can’t print the words that Steve Parish used to describe the zoom when he saw the results on our courses, but it translates to “Gosh! That’s impressive”. And it has a good image stabiliser so you can often hold it steady. Other than the zoom, it’s a solid but unremarkable camera with a slightly quirky menu system. But everyone with a P900 on our courses has a permanent grin - it makes photography fun again and leaves you feeling like a kid. If you’d prefer to be sensible and mature, get the Panasonic FZ300. But life’s too short for that. Don't be tempted yet by the currently-overpriced, enormous P1000. Panasonic FZ300 $570 (down $100 from Aug). If you don't want to go the extra step to an SLR with its interchangeable lenses and low-light shooting, get this instead. Sporting a fabulous lens, it sees four times more light than most compact cameras, making all kinds of photo easier to take. It shoots 12 pictures per second, focuses quickly, takes good video, shoots well at night, has a genuinely effective "Intelligent Auto" mode and it's weatherproof. It doesn't have the over-the-top zoom range of the Nikon above, but it's big enough for almost everything. Alternatively, the heavier, more expensive, non-weatherproof FZ1000 ($760) trades off some zoom reach for better overall picture quality. Olympus TG-5 - $600. Pricey, but worth it. It just works and gives great results. Quick, easy to use, with a reasonable zoom for a 15m waterproof camera, and niceties like an anti-fog lens so you can forget about treating it nicely. There are heaps of accessories to keep enthusiasts happy too, including compatibility with Olympus' off-camera flashes. You really can just PLAY with this camera. Great for worry-free holidays. If you can spend $600 or more on a camera and don't mind the size, think about getting a cheap digital Single Lens Reflex (SLR) or "mirrorless" camera instead of a compact camera. What you lose in compactness you get back in speed, clearer pictures, and much better quality photos in poor light. They also let you put the background totally out-of-focus if you want to, and you can change their flash and lenses for different effects. Mirrorless cameras offer a Goldilocks mix of SLR quality, changeable lenses and quietness without the bulk. They're slowly replacing SLRs. Until recently, they were too slow to shoot action and had poor battery life. But the latest are now competitive with SLRs... only smaller. I'd suggest getting the cheapest camera body you can get away with, and the best (yup, read “most expensive”) lenses you can. This combination will give you the best long-term investment. Your camera is going to be comprehensively superseded by a new model in 18 months, but your lenses won't be. You might already have some lenses from a film SLR camera that you can use. The article linked in the button below explains which lenses might work with a modern digital SLR or mirrorless. Will my old lenses work with my new camera? Many people ask which brand is the best. Unlike cars, there's little difference between any of the major camera brands. See which brand your friends use so you can swap lenses between you. My ideal camera would have a Sony sensor in an Olympus body with Nikon autofocus and flash and take Canon lenses, if only they would fit together! There is no single best system. Right now (2018), Sony, Nikon, Fuji and Pentax (who all use Sony sensors in their cameras) give photos that are more 'editable' by computer - you can brighten and darken them more than other brands. This is great if you enjoy editing photos by computer, and irrelevant if not. First, some second-hand options. A Canon EOS 650D, 60D, a semi professional 7D or a Nikon D7000 are now bargains at between $400 and $700 for extremely competent cameras. If you don't need a warranty, second hand offers much better value than new. Ask the seller how many photos it's taken - it's like the mileage of a car, and these cameras are rated for 50,000+ photos. Check that the sensor is clean, as it's about $100 for a professional to swish away the dust, check that the flash does pop up, and budget for a new battery as the existing one will be tired by now. If it's expensive enough that you'd consider getting it repaired if damaged, ask to see the Australian warranty documents (even if it's expired) to prove that it was bought in Australia. Manufacturers will only repair items bought in Oz. Canon EOS 1500D - $580 with an 18-55 lens. The entry-point to Canon's dazzling array of interchangeable lens cameras. It's a jump up in performance from all the compact cameras above for image quality when the light gets dim. Shop around, as prices vary on these cheaper DSLRs. If you can stretch to it, the Nikon below is convincingly better. 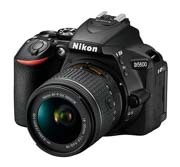 Nikon D5600 - $700 (down $200 from August) with 18-55 lens. Dollar-for-dollar it has the best focus, best image quality, most editable pictures, and also adds great battery life in a mature traditional body with access to Nikon's huge range of accessories. It was our runner-up camera of the year for 2017, and now far cheaper (we've seen it for $620 - if you see one this cheap, just buy it!) it's best camera in this group by a mile for shooting pretty much anything. Highly recommended. Olympus E-M10 MkIII - $800 with 14-42 lens. If size is a consideration and you shoot anything except sports, try this camera. It’s what many people have always wanted: small, light, easy to use (once set up), quick, and it shoots good pictures in any light. Almost full SLR quality in a package smaller than any SLR - it's what mirrorless cameras should be. You can still take manual control too, including advanced stuff like using flash off the camera, and the lenses are small enough to fit in your pocket. Taking pictures becomes fun again, especially with the app that lets you shoot wirelessly through your phone. The 14-42 lens isn't the best quality, but there are good alternative 'micro four-thirds' lenses available - you get what you pay for with lenses. The cameras above all give outstanding results, and few people will need more. But are you curious to know what you can get if you do spend more? The cameras below offer faster shooting, faster autofocus, better build quality, more weatherproofing and a microphone input for professional video sound. To a lesser extent, they will offer better image quality when shooting in the darkest conditions. If you are beginning in photography, I'd suggest getting one of the SLRs above, and spend the extra money on lenses, rather on one of the cameras below. Panasonic G85, $1,100 without lens. Small enough to take on holiday, easy to use one-handed, great results, quiet (silent if you want), robust and weatherproof, fabulous on auto yet it can take you as far as you want to go into photography. Choose from small cheap lenses or gorgeous “serious” Leica lenses. It’s comfy to use with glasses, easy to focus and has a stabiliser so good you can have an extra couple of glasses of wine. There are better cameras for specific things, but as an all-rounder this is the closest we’ve seen to perfect. Loved by everyone we’ve seen own one. 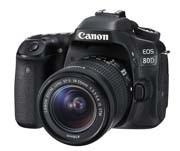 Canon EOS 80D, $1,200 without lens (down $300). Recent price drops bring it back into contention. Excellent quality pictures indoors without flash, takes over 7 pictures per second, and focuses quickly, even with video. The screen on the back is a joy to look at, and it has built-in Wi-Fi to share pictures quickly or control the camera from your smartphone. If you don't mind the size and weight, it's an excellent choice for video or photos. 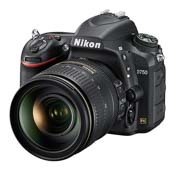 Nikon D750 - $2,200 (unchanged). We used to recommend the cheaper Canon EOS 6D or Nikon D610, but $500 price jumps in both mean that it's now worth the extra for a Nikon D750 instead. An incredibly forgiving camera with fabulous picture quality. You can totally mess up all the settings and still get wonderful pictures in seconds on the computer. It feels like cheating! Its "full-frame" sensor is twice the size of the sensors in the cameras above, giving better results especially in poor light. With sensors evolving every year, a full-frame camera used to buy you about 4 years' worth of better image quality before cheaper half-frame cameras catch up, but the note at the start of this page explains why we expect it to only be about a 2 year advantage today. 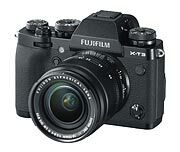 Fuji X-T3 - $2,200 without a lens. We've never recommended a camera this pricy before, but it's our 2018 camera of the year. A joy to use - I bought one the day I tried it. Fast, small, light, silent, robust, weatherproof and reliable with a full system of professional lenses and a separate range of more affordable lenses. Put everything on Auto and shoot away or experiment with the dials on-by-one for easy learning. The focus is incredible for photographing people - I shot an event with every single photo in perfect focus - that's never happened before. It's good - but not great - at sports and wildlife, but for everything else it's a gem. 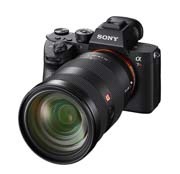 Sony a7 III - $2,750 (down $150). The start of a revolution. A small mirrorless camera that beats all similarly-priced DSLR cameras in almost every way. Fabulous focus that locks onto faces instantly, silent (if you wish), outstanding quality, reasonable battery life, and quick. Drawbacks? The lenses are as large as normal DSLR lenses, and anecdotally it's not as robust as similarly-priced DSLRs. Works well with ALL your old film lenses too with an adaptor. 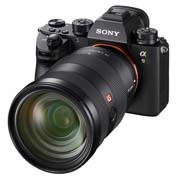 Sony a7rIII, $4,900 - the best picture quality from a camera that isn't enormous. Overkill for 99% of people. Save $2k and get the a7III instead. Olympus OMD E-M1 MkIII or Panasonic G9 $2,000 - small, professional, tough, weatherproof and the only cameras I’d take without a tripod - their stabilisers are incredible. Panasonic G85, $1,100 without lens. It travels well - see the details in the "over $1000" section above. 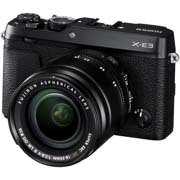 Fuji X-E3 $1,050 without lens. Small, discreet, with olde-worlde styling: many people actually like being photographed by it. Has instant printers which transform your holiday. I use its bigger brother (X-Pro2) professionally, and it feels like play, not work. 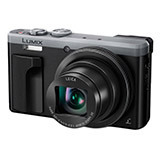 Panasonic TZ110 $720 (down $80). The best affordable, quality camera that fits in a pocket. Based on the TZ90 from the "$150-$500" section above, but with a bigger sensor giving better all-round quality at the expense of zoom reach. A good phone. Phones excel at travel photography... their cameras are built for landscapes and storytelling photos. Small, discreet, light, and good enough quality - even for night photos with the right apps. If you don't need to sell the photos and can put up with the lack of a meaningful zoom, consider travelling just with the phone camera and a battery pack. It's liberating compared to lugging a big camera. FujiFilm Instax SP-2 Printer. $130 (down $90) and $1/print. 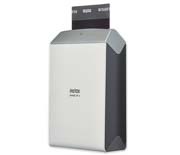 Think seriously about bringing this pocketable instant printer, especially if you don’t speak the local language. It’s a fabulous way to give photos, not just take them, and lets you have fun with people everywhere. The Fuji Instax SP-2 works with any smartphone or Fuji camera, and the delight of watching the picture appear in front of you (Polaroid-style) is pure magic. I won’t leave the country without one. Why these cameras? The most common regret we hear from travellers is taking too much heavy gear. The second most common is wishing they’d taken a better camera. So we’ve recommended small cameras that are good quality, light and easy to use. They all happen to be mirrorless cameras which eat batteries, so bring a few batteries if you’re going to be away from power for a day or more. Many people want a big zoom for travel… they’re fun and good at picking out details and patterns. But they struggle in low light, they’re heavy, and give a flat style of picture. Consider if the tradeoffs are worth it for you, and if so, have a look at “superzoom” cameras like the Panasonic FZ1000. Second-hand Canon EOS 60D or Nikon D7000 with a 50mm f/1.8 lens - $400-600. Tough, weatherproof, fast, built to use one-handed, huge battery life and way better than any new camera at the price. Leave it switched on somewhere quick to grab, and you're all set to capture the joy in your house. 50mm f/1.4 lens ($500 new, $300 second hand). Upgrade your lens to the f/1.4 version from Nikon, Canon or Sigma before you upgrade the camera. It's quicker to focus, lets you shoot in almost darkness, blurs the background beautifully, and resists ghosting from bright lights. The ultimate indoor lens to shoot children. 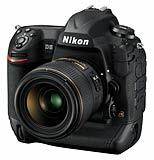 Nikon D5600 or D7500 with 50mm f/1.4 lens ($1,100 or $2,100 respectively). Quicker and better than the second-hand options above, especially in dim light, and both connect to your phone for remote shooting or sharing photos instantly. But still not silent. Sony a6000 with 50mm f/1.8 ($1,050) or Panasonic G85 with 42.5mm f/1.7 ($1,600). The Panasonic can be completely silent - a huge plus for family shooting, especially with a sleeping baby. The Sony is still much quieter than any SLR, or upgrade to the Sony a6300 for an extra $650 for total silence. They all connect wirelessly to your phone for instant sharing. Fuji X-T3 with 56mm f/1.2 ($3,100, or with the drool-proof 50mm f/2 for $400 less) or Sony a7III with 85mm f/1.4 ($5000). Silent, quick, small, wireless and great at focusing on eyes. No, you don't need them. Look away now. Why these cameras? 90% of the priceless family memories happen at home. This is your home camera. It has to shoot a moving target instantly in dim light without flash and without changing settings, all one-handed. You won’t have both hands available for months. It has to blur the background, as the house is going to be a tip for years. You don’t need a zoom as much as you need low-light ability, and you can’t have both affordably. Small size is an expensive luxury for this camera. Can your phone do it? Only for the first 9 months of a baby's life. Once your baby is mobile, even the best smartphone can’t come close to an SLR for these pictures, and that includes the latest twin-camera phones. You’ll miss too much. Phones pick up too much background, can’t freeze movement in dim light, and force you to shoot too close to your baby because their zooms don’t work in low light. These may be the most precious photos you take, and you’ll only get one chance. Your grandkids will want to see these pictures. Don’t mess around here - get the right tool for the job. I've put this here purely so that you know what the state-of-the-art is. Anyone buying one of these will be doing some serious research into their business plan first. 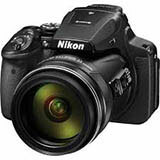 Nikon D5, $8,400 without lens or flash (down $600 from Aug). Or Canon EOS 1DXII ($8,000) or Sony a9 ($5,000). The current state of the art. 9 years on, I still get excellent service from two old Nikon D3s. They give great picture quality in one hundredth of the light needed by the compact cameras above. This means that I can shoot in the murkiest venues without flash and still get shots that clients love. Weaknesses? They weigh 3kg each with a professional lens, and the most sensitive autofocus sensors are clustered in the middle of the picture – just where I don't want them. The biggest downside is its size: it's so big that it cuts you off from the people you're photographing. So I often start a session with smaller cameras (by Fuji) that aren't a barrier. The smaller Nikon D750 is a more sensible buy for 99% of people - just slower and less solid. For the ultimate in picture quality from cameras of this size, Canon's 5DS ($3,900), Nikon's D850 ($4,300), Sony's tiny A7RIII ($4,000) and Pentax K-1 (good value at $2,500) can capture unprecedented detail. But you'll need top-notch (expensive!) lenses, very steady hands, and no caffeine if you want to see much difference. 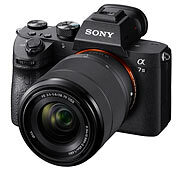 The Sony a7III, a7RIII, and a7SII are interesting because they're designed to work well with lenses from other manufacturers through an adaptor. So if you've got lots of expensive Canon lenses, the Sony could still be your next camera. And a Nikon lens adaptor is due soon. Canon and Nikon still rule the roost for these professional workhorses - not because they're better than other brands, but because you can rent, service and repair their cameras and accessories almost anywhere, and because they have a staggering range of accessories and lenses. But if your livelihood doesn't depend on it, all brands offer similar quality. If you need even more quality for demanding commercial assignments, you're looking at a “medium format” camera or even a “large format camera” – $10,000 to $40,000 for digital. Happy shopping! We only recommend cameras that we've actually used or taught beginners how to use. Just because a camera isn't here, doesn't mean it isn't good... it might just mean that we haven't seen it yet to review it. We update this page as we see how people go with new cameras. Note that the photos on this page are not all to the same scale. Megapixels don't feature on this page, because all new cameras have more than enough megapixels for 99% of people. See this article to find out why megapixels really don't matter anymore. The prices are in Australian dollars and come from web searches for cameras that have full Australian warranties, from retailers that have actual stores unless otherwise noted. You can get them cheaper online if you're prepared to forego the manufacturers' warranties and service support by buying "grey imports". Many stores in Brisbane have slightly higher prices, which is justified if you're going to spend time trying the cameras, which we would recommend, and many offer good pre- and post-sale support. Some shops may match others' advertised prices too. Proven cameras. We may not have seen the latest ones yet. Easy-to-learn cameras that perform well for beginners as well as enthusiasts. For the record, our current cameras include Nikon and Canon professional digital SLR cameras, Olympus and Fuji mirrorless cameras, Canon, Olympus and Panasonic compact digital cameras, and a range of film cameras including Hasselblad. And 25 lenses between them! So far, the 13 major camera companies have created over 2,500 digital camera models between them, with over 70 brand-new ones announced each year. Web sites such as dpreview.com keep up with the deluge, and have an encyclopaedic database featuring almost every camera, with recommendations from experienced reviewers. If you understand the camera jargon (or want to learn it), those web sites have heaps of information.